…to win the dream wedding you never thought you could have!!! The Boutique Bridal Party, Buffalo’s only indie bridal organization, will hold their annual bridal show on February 27th 2014 at the Hotel Lafayette where they will be giving away over $15,000 in prizes towards a dream wedding to a couple in need. 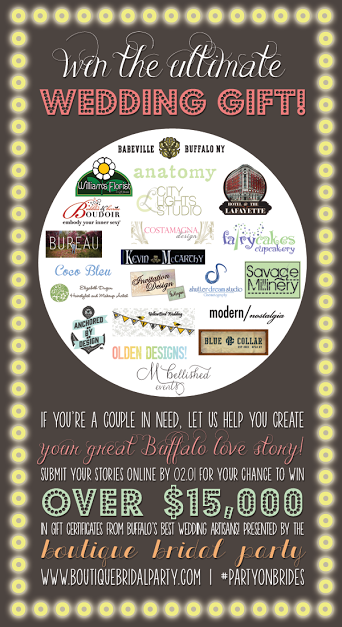 The Buffalo community is at the heart of the Boutique Bridal Party, which is why this year the talented vendors participating in the event are donating their time and services to one lucky couple! Everything from the engagement photos to the wedding favors will become a reality for a bride and groom who have been forced to put their dreams on hold. The Boutique Bridal Party will be accepting submissions from couples that have experienced true hardships that have prevented them from reaching wedded bliss. The top choices will be interviewed and reviewed by a panel for selection to the finals, in which the stories and videos will be posted on The Boutique Bridal Party’s Facebook page. The followers of the Boutique Bridal Party will get to vote on their top story and the winner will be announced live, at the closing of the event in February!! Simply submit your story, 500 words or less, and 1-3 photographs of yourselves to info@boutiquebridalparty.com by 02.01.14! The top selections will be announced on our Facebook page where voting will take place & the winner will be announced live at our bridal show on 02.27.14!